How is import cargo released from South Africa Customs to importer? What is the customs process in South Africa to import? Who are the parties involved in import customs clearance formalities in South Africa? Import cargo clearance in South Africa Customs. The information provided here details on how to import goods to South Africa especially import customs clearance procedures in South Africa. The South African Revenue Service (SARS) administers the customs department of South Africa. The South African Customs Administration plays an integral role in the facilitation of cross border movement of goods. SARS is legally mandated to enforce the use of Electronic Data Interchange for the submission of certain cargo and goods declarations and reports. Everyone doing business with SARS should register for EDI. SARS offers a Single Administrative Document (SAD) to facilitate customs procedures. Process to import to JOHANNESBURG. Requirements of customs to import to EAST LONDON. Customs requirements in DURBAN to import. Customs needed to import to Capo town. How can I clear customs to import in Johannesburg. What Customs formalities required to import in Nelspruit. What should I do to import goods in Johannesburg. How to get import customs permission in Durban. 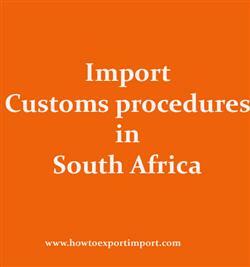 Procedure to get customs clearance to import in Cape Town. Mandatory process need to complete import in PRETORIA The way to get customs clearance process to import in Cape town. Import customs procedures required in PRETORIA. Import Customs process in PORT ELIZABETH. Fenella: On 27 February 2019 My daughter is currently studying in south Africa and is using my Zimbabwe registered vehicle to get around. We keep having to take the car out to renew the temporary import permit obtained at the border every 6 months. Is there a longer solution?